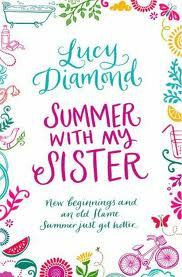 I loved The Beach Cafe by Lucy Diamond last year and so it didn't take much persuading for me to buy her recent release Summer with my Sister. It is quite clear from early on in this book that the two main characters Polly and Clare are two polls apart and they clearly do not get on and yet they are sisters! Polly has been living away from the family village and her parents are very prod at what she has achieved in her high powered job. Soon Polly's world is turned upside down when she is unexpectedly made redundant and with no other option she has to head back to live with her parents but she can't bring herself to tell her parents the truth. Sister Clare is bringing up her tow children alone and is trying to hold a part time job down at the local surgery but it is getting harder to try and make ends meet. When she finds out her sister is coming back to stay with their parents she is less than excited about seeing her and instantly is curious as to the real reason of her sisters stay. Will the sisters be able to put their differences aside and help each other out of their current situations? When I first met our little workaholic Polly I have to say I didn't like her character and this was a little worrying as one of the most important parts of a good book is having a likeable character, but luckily as the book progresses and Polly returns home her character begins to change and I started to warm to her character. I instantly warmed to Clare who was a very realistic character struggling to juggle work and family life whilst trying to make ends meet something the majority of us can relate to. The storyline wasn't too challenging and made for a great light hearted read, there were only a handful of characters which I love as there was no problem trying to remember who was who. I loved the build up the author created around the situation involving the girls brothers death this is what kept me turning the pages eager to find out what had happened. This story is full of heartache, romance and family secrets which all rolled into one created a great sentimental read. I really enjoyed this book and it is well worth a read, but I still say The Beach Cafe is my favourite by this author! Thanks. It is always interesting to read about new books.